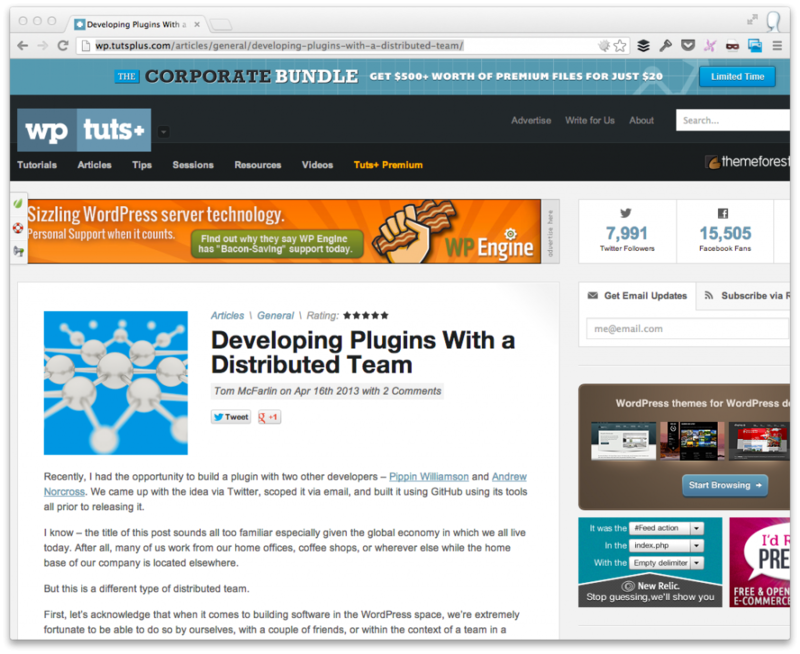 In my most recent article on WPTuts+, I discuss what it’s like working with a distributed team and WordPress. The point of the article was to give a short summary as to how it’s possible and what’s required to do good work. I wanted to share that it’s completely possible, but there are some key things that are necessary to make sure that good work actually gets done. Scope is Key. Identify the core features of your plugin and stick to working on them. Delivery Date Matters. Set milestones that hold one another accountable for completing the project. Keep it Open. Allow users to contribute bugs, feature requests, and even code. Obviously, I elaborate much more on this in the context of the article, but the gist of the article can be reduced to what’s above. So with that said, be sure to check out the article. Comments are closed on this post. Please keep the discussion on the original article. Previous PostPrevious Are You An Open Source Pragmatist, Really?